Really, it can be enjoyable! We had booked our reservation at the High Lonesome Hut (www.lonesomehut.com) in Fraser, CO to spend New Year’s Eve in the backcountry. 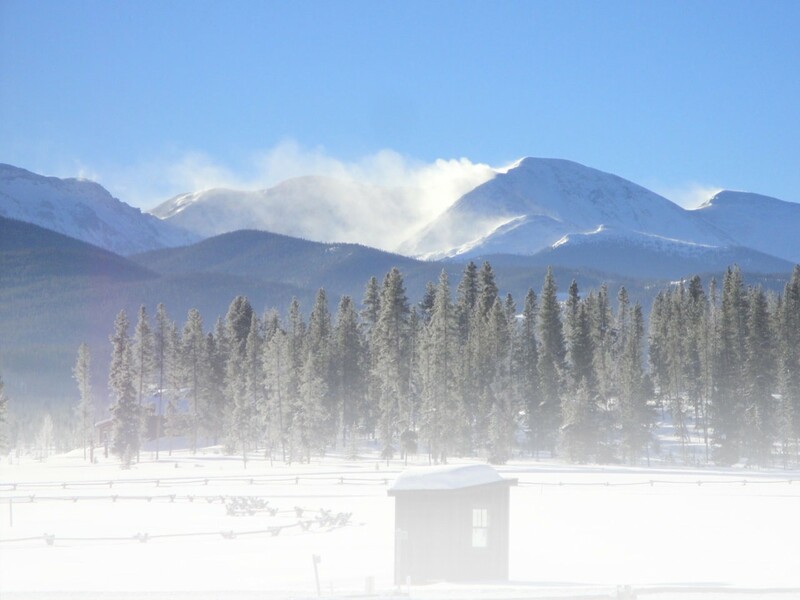 The High Lonesome Hut is a self-contained cabin 2.5 miles from the trailhead in Grand County, near the Winter Park ski resort. We planned to snowshoe in our gear, food and champagne on sleds attached to our back. The group consisted of my wife Kathy, her cousin Susie and her husband Matt, our college age kids (Nicole and Megan) and a few of their friends for a total of nine people. Just after Christmas 2014, I started to see news reports of an arctic blast heading for Colorado. It received so much hype by the news media, that cousin Susie called to check and see if the trip was still on. After paying a nonrefundable amount for nine people, there was no way that I was going to cancel the trip. We’ll burn every split log at the cabin if we had to. Cousin Susie wasn’t convinced, and my wife jokingly reminded her to bring a coat. Susie was not amused, and reluctantly decided to go along with the rest of the party. After driving in from the Denver metro area, we met for coffee at Rocky Mountain Roastery in Fraser, CO www.rockymountainroastery.com, located about 10 minutes from the trailhead. By this time, it had warmed up to 5°. Will, Megan, Kelton and Delaney at the trailhead. The trailhead is only a few miles down a dirt road off of highway 40. This dirt road is plowed during the winter since the Arapahoe National Forest has many access points for snowshoeing and cross-country skiing. Once we arrived, I received a late Christmas present: the trail’s 2 feet of powder was recently groomed by the cabin owner with a snowmobile. That meant dragging our 3 heavy sleds would be pretty easy. After getting all of our gear out of the car, strapping on our sled harnesses and snowshoes, our party headed up the trail to the cabin. Nicole and Delaney pull two of three sleds in our expedition party. The groomed trail was great, and there was only a few hundred feet of vertical stretched out over a couple of miles. When we arrived, the hut was a warm 55° and it didn’t take long to get the wood burning stove cranked up to heat the entire house. This is what I would consider a luxurious off-the-grid cabin, because it has solar power and a backup generator to provide lighting, a propane stove for cooking, and even running water with a real toilet. This is a great choice for families with small children or people without a lot of experience going to huts\cabins in the Colorado backcountry, such as those offered in the 10th mountain division (www.huts.org). We removed our snowshoes, and settled down for the evening. High Lonesome Hut in Fraser, Colorado. Just because you have to drag all of your food almost 3 miles on the trail, that doesn’t mean that it has to be freeze-dried meal replacements. We like to eat well, as dinner consisted of homemade bread, salad and prosciutto wrapped barbecue chicken thighs. My wife likes to cook, and we are a good match, because I like to eat. It was well worth dragging the weight of wine to go with this scrumptious meal. When darkness fell, it quickly dropped below 0°, and we had to use plenty of firewood in the stove to keep the cabin warm. We knew it was going to be cold when we woke up in the morning, we just didn’t know it would set a record. Kathy tries to convince Holly to drag the sled, but to no avail. In the morning, we were greeted with brilliant sunshine, crystal clear blue skies, not one bit of wind and a crisp temperature of -28°. We were in for a perfect day. After breakfast, everyone was anxious to go snowshoeing. Even the two dogs we brought along were ready, anticipating the adventure ahead. Proof of the cold temperature. Our group was breaking trail in the powder. After about a half hour, even though it had barely gotten to -20°, we were warming up and starting to shed our layers. The trail was mostly flat and went through the forest and then opened up to several beautiful meadows. The second hour, the trail followed a meandering creek, which of course was frozen over. After about 2 1/2 miles, we reached the summer parking lot for Strawberry Lake. The lake was actually another mile or so up the trail, but with the deep powder we decided to turn around and head back to the cabin. 5 miles through deep snow would be enough. We were all famished, and decided to have grilled cheese sandwiches in a cast-iron pan for lunch. Group photo at the Strawberry Lake summer parking lot. We spent the afternoon sledding down a hill that was right next to the cabin. The sleds were provided by the cabin’s owner, and in Colorado, that meant we were using kayaks. These two-man kayaks were perfect for going down the hill rather quickly. We didn’t even notice that it never got above 0° that day, and we couldn’t wait to tell all of our friends how we survived such extreme cold conditions. Little did they know, but it was not hard at all! It was fun, and allowed us to have a pretty good story. Nicole spilling champagne at sunset. At sunset we popped champagne and toasted the coming new year and the unique experience of spending this holiday at the cabin. It was very quiet and the moon shone brightly. Being at the cabin allowed us to feel like we had really “gotten away from it all”. The next morning, we packed up our gear and headed back to our vehicles. We arrived with a dead battery in 2 of the cars, apparently unable to handle the frigid cold for two nights. Luckily the third one started, so I was able to jumpstart the others. But I got to thinking, what if we only had a small group and brought one car, what would we do? After doing some research I decided to buy a small battery for $90 that would help in this situation (PowerAll PBJS12000R Rosso Portable Car Jump Starter). It is specifically made to jumpstart car batteries and is only about 8 inches long so it is easily stored in the car. I haven’t had to use it yet, but I’m confident that it will come in handy whenever it’s needed. What started out as a trip with concerns over the frigid weather, ended with a great snowshoe vacation. The cold was not a factor with the sun and dry air making a tremendous difference in our experience. So, don’t let the temperature outside stop you from enjoying a snowshoe adventure. Snowshoeing is a great experience, a great workout, and as long as you keep moving, you won’t get cold, no matter what the temperature. This entry was posted in Destinations, Destinations, Features, General, Homepage Featured by John DiGirolamo. Bookmark the permalink. After moving to Colorado in 2006, John fell in love with the Colorado mountain lifestyle, including snowshoeing, skiing, hiking, biking and SUP. John currently resides in Broomfield. Did you look to see if the jump starter can handle the cold. I would think that the cold killed the batteries, and the cold might kill the batteries in a jump starter. According to the website, yes, they should provide enough power to crank the battery. It is probably a good idea to check the charge before winter starts. Also, the batteries were featured on the show “Motorweek” you should be good to go!